Last year was my first year with a back yard vegetable garden. Tomatoes were one of the most successful vegetables. With the hot summer and the mild, long fall we ended up having good gardening weather until October. I still had tomatoes ripening in the front window in December when I decided it was time to call it a year and preserve them. I have canned only jam. Only once. It was still the ’90’s and I was a college student with lots of vacation time at home to pick fresh strawberries, collect and sterilize jars, create customized labels and deliver gifts of the finished product to friends and neighbours. I hope to get into other more ambitious canning in the future when time permits. In the meantime, for my first year as a gardener I decided blanching and freezing was going to be good enough, especially with only the random leftovers from 3 tomato plants to deal with. 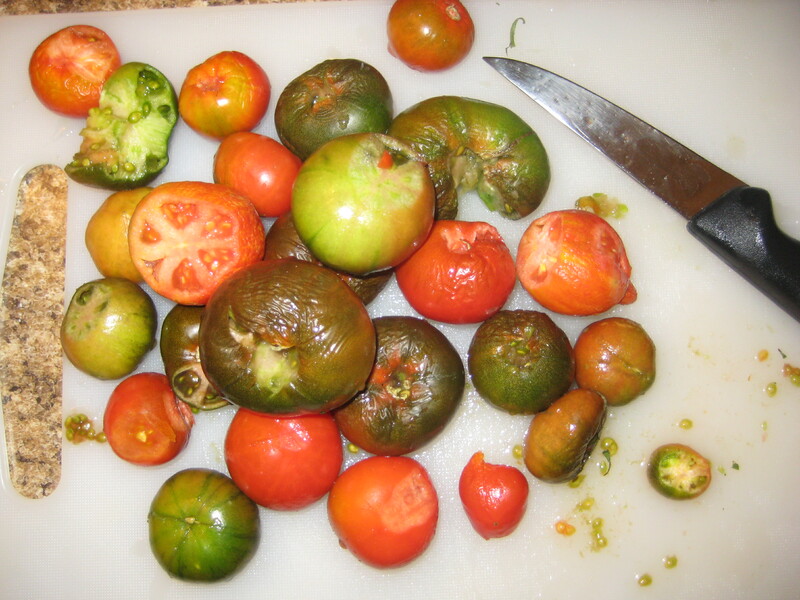 To prepare for blanching, the above tomatoes were washed in cold water, and the bad spots and top stems removed. After about one minute in the pot of gently boiling water the skins split. 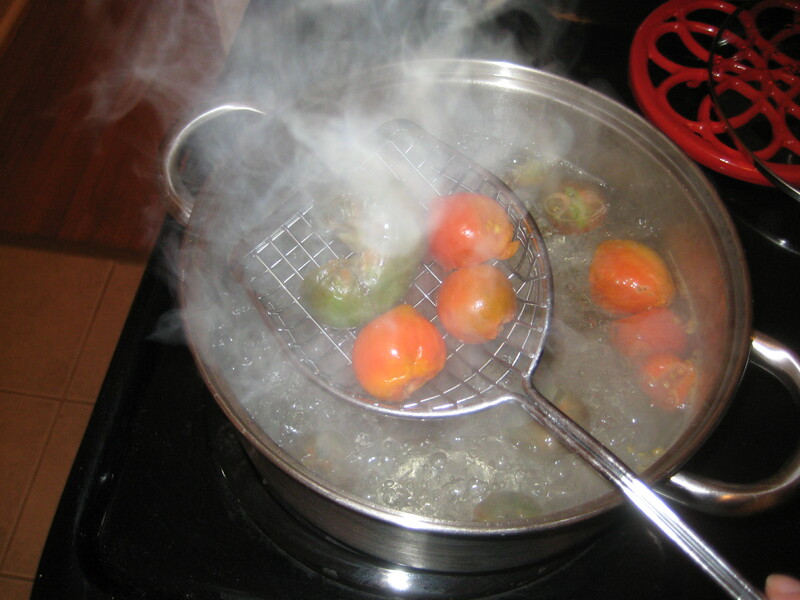 Then it is time to plunge the tomatoes into a bath of ice water. After about a minute in the ice water bath, the tomatoes are cool, and their skins slip off easily. 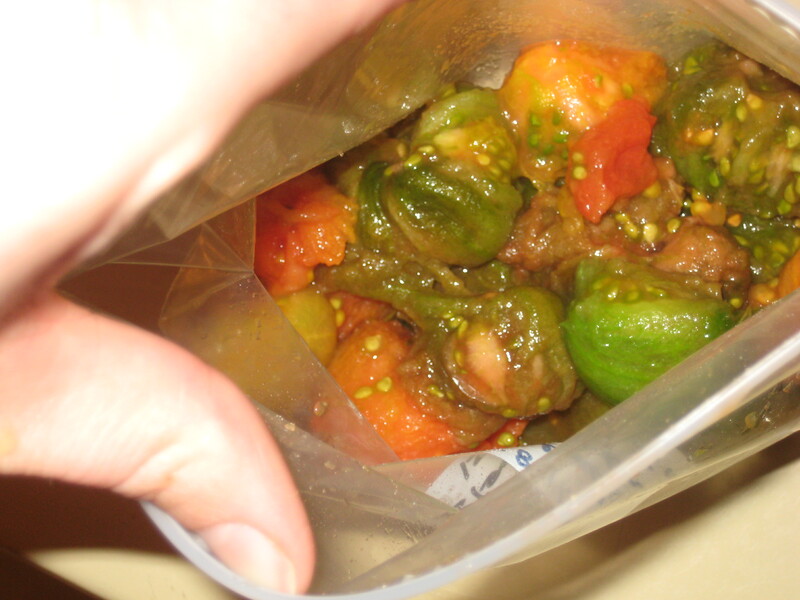 Drain the water in a colander and throw them in a freezer bag. Pretty simple. I gave the bag a detailed, dated label, along with suggestions for use of this late growing batch since things can get lost and forgotten so easily in the freezer. Then I threw it in the freezer and called it a day. 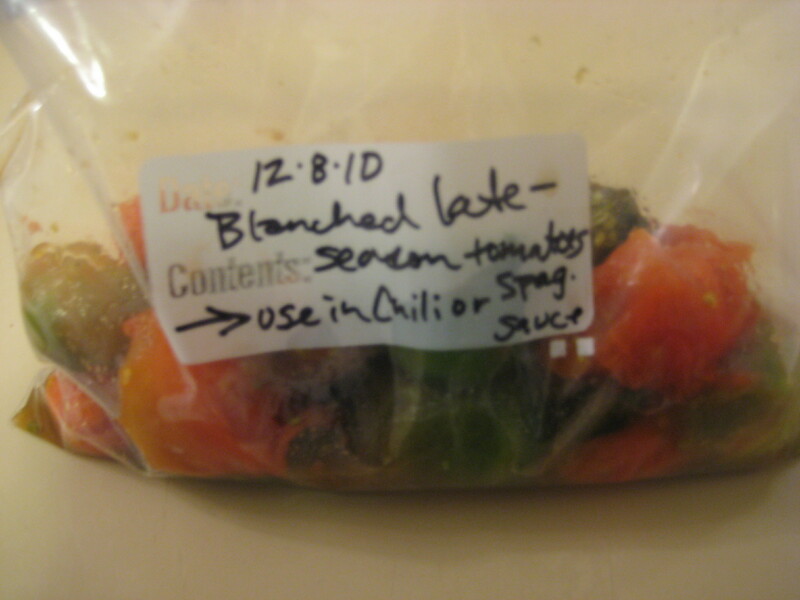 This entry was posted in Our Garden and tagged blanching, canning, freezing, ice water bath, late season tomatoes, simple, Tomatoes by Our Way to Eat. Bookmark the permalink.